People looking for content use search engines in many different ways, and use a variety of search terms. Keyword research is the method of taking your main topic keywords (called “head terms”), and creating a list of potential search phrases (called “long-tail keywords”) that you can incorporate into your posts. The payoff of keyword research is that your writing will contain terms and phrases that real people search for in connection with the things you’re writing about. You’ll potentially rank (or rank better) for those terms in search engines, which could translate to more visitors for your site. You’ve already got a great topic in mind for your next post, so… now what? First, you’ll want to make a shortlist of the most generic terms possible around your topic. For example, if you’re writing a post for your award-winning chocolate-chip cookies, your list may include terms like cookie recipe, chocolate chip cookie, or chocolate chip cookie recipe. It’s perfectly fine if you only have one or two items in this list of generic phrases (these are the head terms mentioned earlier). We’ll soon expand this list. Now that you’ve got your shortlist of head terms, it’s time to get organized. Any sort of spreadsheet program like Microsoft Excel (free trial), Apple Numbers (free for most Macs) or Google Sheets (free) is great; you can even use a simple text or notepad program already on your computer. Open up your program of choice, and add your generic head terms. If you’re using a spreadsheet program, put one head term in each column. Now that we’ve got a few head terms to work with, the next step is to expand this list into a larger list of potential terms that reflect real-world searches. We do this because most people will attempt to be somewhat detailed when searching for specific information. An example of long-tail keywords at work would be what you experience looking for shoes online. Searching the generic head term “shoes” will deliver countless sites where you could buy shoes, but the search results aren’t detailed enough to be useful. Searching for a long-tail keyword like “size 8 women’s leather hiking boots” will yield a set of results that are more tailored to your needs. If you were to search for “keyword research tools,” you’d find countless results, and hundreds (maybe thousands) of tools that range in price from free to exorbitant. We’ll stick with the free options, but if you’re a serious content-creation machine, you may find value in some of the paid tools. My favorite keyword research tool is Google itself, and you can learn about people’s search habits in relation to your topic simply by running a few searches. 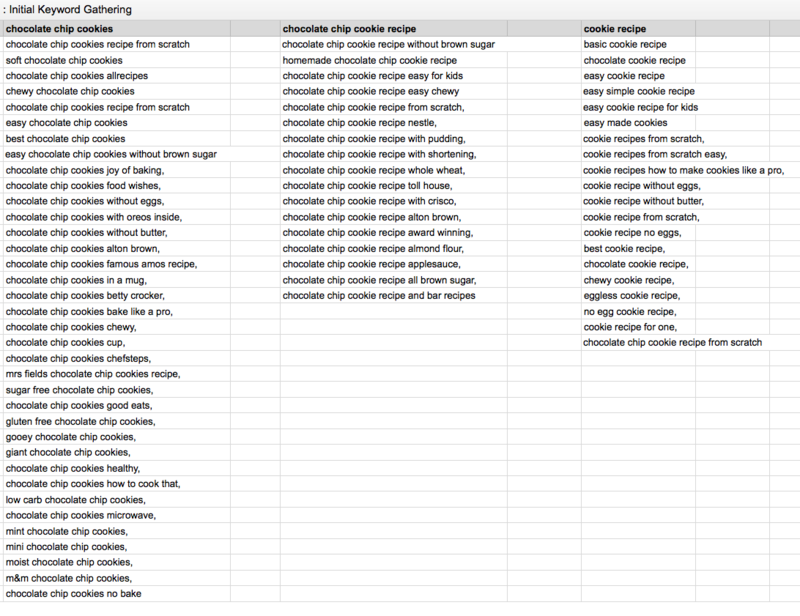 Let’s kick off our long-tail keyword research by looking up chocolate chip cookie recipe. Of course, you’ll see the expected list of recipes; let’s scroll to the bottom to find the real gold: Google’s related-searches section. “Searches related to…” is an often-overlooked part of the Google search results page; but it’s wildly useful for searchers and content creators alike. This section is generated based on actual user searches, as well as Google’s algorithms. Run similar searches for the head terms on your list, and when you find keywords that resonate with your blog post, copy and paste them under the related column on your spreadsheet. A good start would be 10-20 long-tail keyword terms under each head term. The exact number might vary depending on your particular topic. Another one of my favorite keyword research tools is KeywordTool.io (free, with paid levels). The real power in Keyword Tool is that you can search not just Google, but also YouTube, Bing, and Amazon. The data that you see is pulled from auto-complete/suggested search results. We’ll use Keyword Tool to generate keyword ideas from YouTube, Google, and Amazon. The YouTube search can often yield great keyword ideas if you’re writing a “how-to” post, and Amazon keyword ideas generally revolve around products related to a keyword. Once you’ve opened Keyword Tool, click on the YouTube tab. 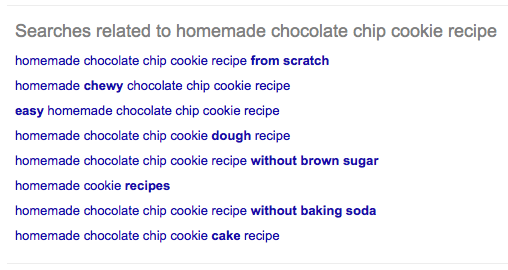 Type in one of your head terms (we’ll use chocolate chip cookie), and click the search button. Select your country and language here if needed. Keyword Tool can give you non-English results if you need them! Typically, you’ll see quite a few keyword suggestions presented. You’re likely to see a mix of repetitive terms and new ideas. Check the box of those you’d like to keep, and click the Copy button in the lower right-hand corner of your browser window. This will allow you to paste them into your keyword list. Once you’ve pasted those terms into your list, return to Keyword Tool, click on the Google tab, and then on the Questions tab. Along with a normal search, Keyword Tool provides a search that returns questions related to your keyword, allowing you to explore real questions that people ask in internet searches. You’ll see several results in the form of questions. If you look at a very generic term, you’ll see more questions than if you use a more specific term. If you can incorporate those questions into your blog post (with a solid answer), you’ll already be ahead of the pack attracting visitors to your site! You can also select and copy these questions to add to your spreadsheet. While you might not want to use them word for word, consider incorporating them in your blog posts in some manner. If you’re writing a product-centered post (or even if a product is tangentially related), the Amazon search can surface some interesting supporting keyword ideas for your post. Beyond direct keyword matches, search engines will also look for terms that they expect to be related to your main keyword/topic. If you’re an Amazon affiliate (or use a similar program), this is a great way to find products that you can link to with your affiliate code when using your keywords! With the Amazon search, you’ll typically want to break your head term down to a single word without any sort of adjectives or modifiers. So instead of chocolate chip cookie, we’ll use cookie. Searching for that keyword returns a number of suggestions, but we can immediately see some useful keywords. By now, you should have a sizable set of keywords to draw from. If you’re using a spreadsheet program, your table will look something like this. You’ll almost certainly have a few duplicates; you can go ahead and remove those immediately. There will also likely be a few items that, after a second glance, don’t really make sense for your post; go ahead and delete those keywords as well. You’ll still have a lot of potential keywords. There’s absolutely no need to use all (or even most) of them. This is simply a list of terms you could pull from to supplement your blog post’s topic. The key to successful keyword usage is to keep your sentences natural, and to avoid keyword stuffing. Ever read a blog post that sounded repetitive because the same few words were used over and over again? That’s keyword stuffing. By peppering your writing with terms that real people search for, you’re helping to guide search engines to your posts when potential readers look up those terms online. I’ve adapted my baking methods to come up with a chocolate chip cookie recipe that the kids can make. I’ve adapted my baking methods to make a chocolate chip cookie recipe easy for kids. In addition to the potential for higher search rankings, these long-tail keywords might be highlighted on the search result page when your post is shown as a result. This is helpful especially when you’re using longer-tail keywords that more directly target a specific search; having the exact phrase someone searches for is an advantage and draws a bit more attention to your site’s result. Want a bigger boost from your keyword research? Use up to 15 of your most generic terms as tags to show up in the WordPress.com Reader topic listings. As a keyword research beginner, you’ll spend a fair amount of time figuring out the process. As you get into the habit, you’ll eventually put together an excellent set of keywords within minutes. Even though it does add an extra layer to your blogging process, finding and incorporating those keywords into your posts in a natural-sounding manner will attract more traffic and visitors from search engines. Do you have questions about keyword research? Let us know in the comments, and be sure to check our earlier posts on SEO! Thank you for breaking it down. I have been intimidated by trying to figure out SEO. This makes sense. I’ve noticed on a very few keyword searches (less than 10 over a few hundred searches), it may not show. Thanks Chris — looks like it’s being blocked. I’m at work right now and I know I’ve seen related searches at home. Guess I’ll hold off on my project till then. Back to me pretending to work. Great post! This is such helpful information. I’m never a slave to keywords and SEO tracking, but it does make me think about what I may be missing that would still be in line with what I’m writing. Thanks! You are a good blogger and your pics are amazing! Keep up the good work! Thank you for sharing this information. I’ve never been completely sold on keyword search and SEO, but this article puts things into better perspective. Great article. I have learned couple of things here. But, I have a little problem with my new WordPress blog. How can I change the keywords I filled in initially, when I set up my blog? Is it possible to change the keywords? Please send me a link to guide me, if any. Thanks. Thanks for this – I’ve been wondering how to incorporate keywords and this has answered my queries perfectly. great information to slowly digest. my brain felt a bit fried on the first read through – but that’s me. i might print the post and reread with a cup of tea. Where I have to put these keywords to the long tail? Some great information for someone who has just started a blog. Does this also apply to the tags that I create for each blogpost or just the post itself? Hi! You can use some of the keywords as tags or categories, but be sure to keep it at less than 15 so that the post will be able to show up in the topic listings! Love this! Thank you :). I just had an ahha moment! Thank you for these tips! hmm every body wants traffic, and you are having some now! thanks anyways. I just got my creative juices flowing! Thanks! Huge Thankyou for this post, I have been meaning to get an understanding on this. I need to read you post a few times. Brilliant what I needed. Are you able to post on Disclaimer, disclosure statements, affiliated links an disclosure statement. And FTC – what yo have to watch out for in blogging, and is FTC applicable only in USA or if like me you are in London. I would be so grateful on a blog that covers the legal bits of trying to making money on blog through amazon affiliated links and anything else you want to sell. How to manage tax, self assessment and all that. I can not one post or article that covers all of this in one go. I know I ask a lot, but oh my would I appreciate it. I am reblogging your post it a must read, must know. Hi there! Being that you’re asking for legal requirements and advice, it’s best to contact a lawyer in your locale that can assist you in navigating disclosure requirements in your area. You could definitely use the same tactics for fiction. Fans of Twilight may want to look for other books using phrases like “vampire stories” or “young adult vampire fiction”. The possibilities are endless; you’ll just need to figure out what sorts of terms relate best to your writing’s plot. It’s best to start out with those generic terms and work towards more specific ones as you use the tools. Excellent post. Useful and well explained. Thank you very much! Great information! Thank you for taking the time to share. I am just starting out on WordPress and I am still trying to wrap my head around how to get the most out of my categories and tags. The keyword search tool will be great for influencing phrase choices while writing but do you have any further advice on how to effectively choose categories and tags? It’s difficult to think of what would actually apply to my writing. Thank you so much! For categories, I typically pick one of two very broad categories. For the cookies example in the post, you could go with “Cookies” or “Desserts” or something similar. As far as tags, you can be a bit more descriptive. 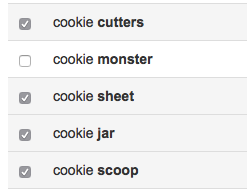 Things like “cookie recipes”, “dessert recipes”, “chocolate chip cookies”, “cooking for kids” are all good possible tags. Thanks for the response Chris! I decided on a “Self Improvement” category but will need to do some more brainstorming and research on tags that will be specific enough but also popular so as be the most discoverable. Thanks again.